TerraFly has technology in place to overlay any geo-referenced information of interest for your Company over the aerial photography available on TerraFly anywhere in the continental United States. Secure access to these custom overlays will ensure that only certain employees, contractors and partners of your Company will have access to this customized visualization tool. 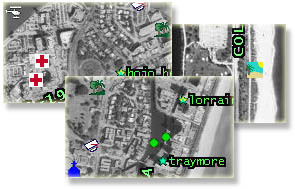 Custom overlays over imagery in TerraFly are supplemented with customized PointData pages, which provide related detailed overlay information in the vicinity of any point clicked by the user on the imagery. (For more on the PointData page please click here). The following overlays are currently available for general TerraFly users. A custom data visualization solution can be built for your Company utilizing this state-of-the-art TerraFly technology. Request more information at .